Deb's Cup of Tea: Spring is Coming! 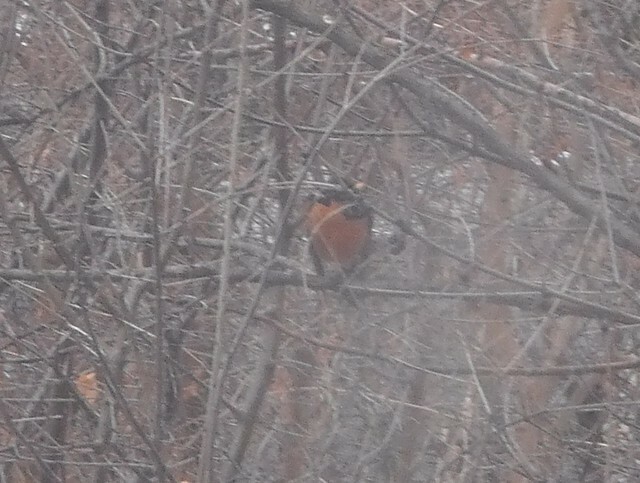 The first robin sighting of 2011. I thought, on Friday, I heard one call but I couldn't find it. Proof! We used to feed the birds. It was a wonderful thing to do. We didn't get many "exotics". It was the usual house sparrows, juncos, chickadees, cardinals and grackles. There were and still are downy woodpeckers in the area. Last year, I had the Cooper's Hawk rest on the neighbor's fence. In the summer, I'll see goldfinches occasionally. I miss it. We had a feeder that attached to the window and, once the birds realized the cats couldn't get to them, they would frequent the feeder. We got some excellent views of cardinals and chickadees in the winter. We would get squirrels who also, eventually, realized we couldn't get to them so they would sit in the feeder eating the bird seed even when we'd rap on the window. Sometimes I think I'd like to do that again, but there is a cost I can't quite fit into the budget right now. The best I can do is provide a pseudo bird bath in the form of an upturned garbage can lid which I keep filled with water. Huzzah! With the sighting of the first robin, spring's milder weather is upon us.